A new version of [Cameo](vimeo.com/blog/post:617) has just been unleashed on the world, and we are excited to announce that it now includes **built-in uploading to Vimeo**! (Quick refresher: Cameo is a wonderful and award-winning iOS app that enables you to make awesome cinematic videos using just your phone.) 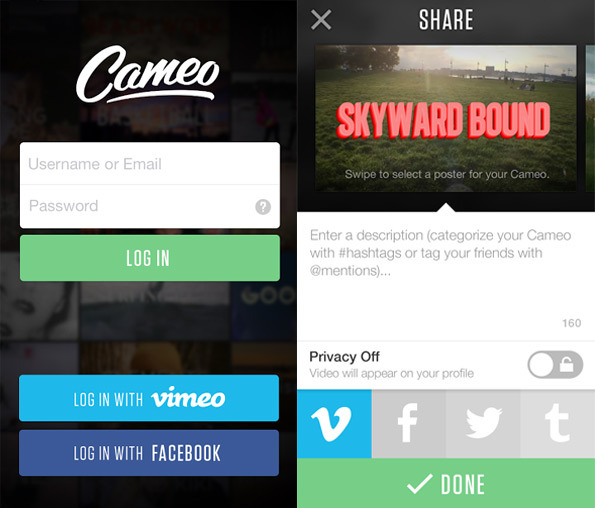 What this means is that you can now seamlessly share your Cameo videos directly to Vimeo — simply sign in to Cameo with your Vimeo account and post away. It’s pretty slick. ! (f.vimeocdn.com/si/blog/cameo_integration.jpeg) BUT THAT'S NOT ALL. The newly Vimeo-d Cameo has a couple other changes to get psyched about: + **Badass soundtrack browsing**: We redesigned the soundtrack library to include genre sorting and a fun interactive player so you can preview tunes more swiftly. Simply swipe to quickly check out lots of music. + **Email confirmation**: Once you’ve successfully uploaded a Cameo video to the cloud, you'll receive an email reminding you to share your masterpiece with friends and family. (And yes, you can easily opt out of the email.) Grab these new features by [updating to the latest version of Cameo in the App Store](on.cameo.tv/UmUYhY). 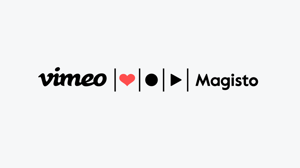 Vimeo is teaming up with Magisto to power professional quality video creation, at scale. I'm not sure if I want to see an influx of iPhone movies on Vimeo. The community has thus far kept a relatively high ratio of quality stuff. We've had this conversation many times with users in the past anytime we release an update for our iOS or other mobile apps. The fact of the matter is the Vimeo experience will always be what you make it by following your favorite users, tags, etc. Oh well absolutely, can't possibly allow the riff-raff on with phones can we? You're posting videos online, not saving the world. Get a grip of yourself! Open the gates wide! Let 'em in! Thanks for the feedback. It's true I've seen a lot of changes in vimeo over the four years yet things always seem to remain amazing. I trust you guys. Group hug? Protip: you can share any of your past Cameos to Vimeo, right from your profile. Just tap the options button [• • •], then tap Share! By submitting a video, you grant Vimeo and its affiliates a limited, worldwide, non-exclusive, royalty-free license and right to copy, transmit, distribute, publicly perform and display (through all media now known or hereafter created), and make derivative works from your video for the purpose of (i) displaying the video within the Cameo Service; (ii) displaying the video on third party websites and applications through a video embed or Vimeo’s API subject to your video privacy choices (if applicable); (iii) allowing other users to play, download, and embed on third party websites the video, subject to your video privacy choices (if applicable); (iii) promoting the Cameo Service, provided that you have made the video publicly available; and (iv) archiving or preserving the video for disputes, legal proceedings, or investigations. It seems I deleted by accident a video on vimeo, is there anyway to restore it ? The video was : vimeo.com/100919600 and it's very important to me. Vimeo must be careful with lop-sided favouritism: Too much web real-estate taken up with a Apple-centric service. As long as Vimeo doesn't start forcing "we thought you would like" videos on my feed, I don't see an issue. I have a windows phone ( 1020) which takes far superior video over an I-phone. Also, most android phones take better video then the I-phone.....where is an app for the rest of us? Will devs be able to add cameo features into their apps via your api? This conversation is missing your voice. Please join Vimeo or log in. Email address is already subscribed. Subscribed! Keep an eye on your inbox.